Any food journey in Lucknow has to start with Tunday Kababi. Just like Paradise Hotel in Hyderabad, if you go to Lucknow and do not have kababs there your trip remains incomplete. So, on our visit to Aminabad area, our first stop had to be Tunday Kababi. The restaurant is located on a busy road with eateries on both sides of it. Aroma of food wafts in the air as you enter the area. Our cabbie dropped us 200 metres away due to a traffic snarl, and we walked down to the place looking at roadside vendors making sheermals and naans. 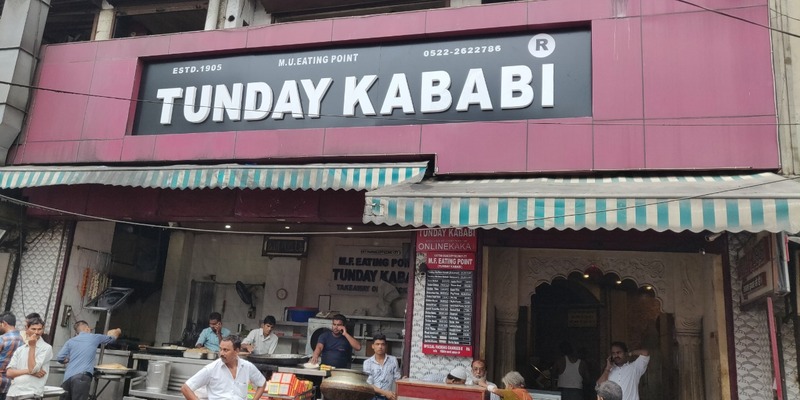 At Tunday Kababi, you can watch the kababs being prepared right in front of you in front of the shop. It is said that the original Tunday kababi lost one arm when he fell from a roof while flying a kite about a century ago. But such was his expertise that the continued to make kababs with one hand. 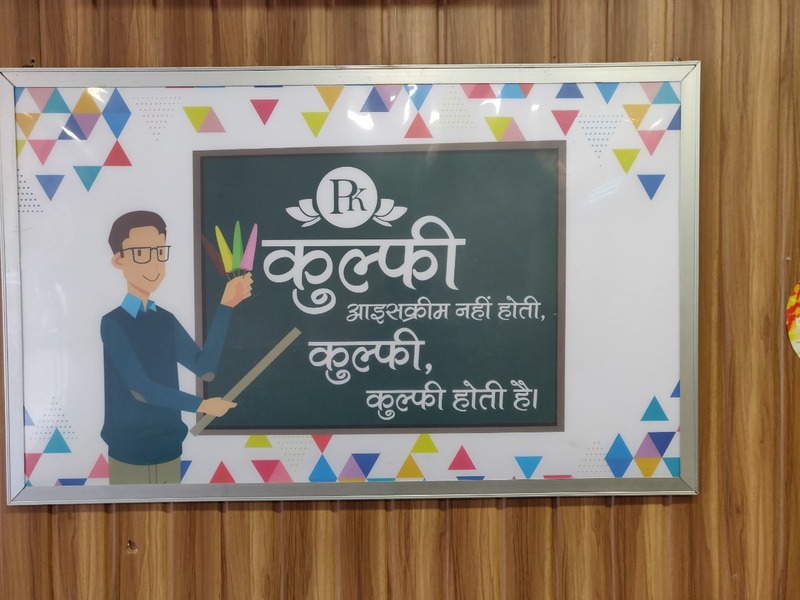 The kabab supposedly uses more than a hundred different types of spices, and as per street talk, it has medicinal herbs to ensure that you do not ever get abdominal problems or acidity after eating these. The paratha which is the usual accompaniment for the kabab is prepared on an inverted pot and is aptly called ulte tawa ke parathe. The first floor of Tunday at Aminabad has a fairly large seating space. We promptly ordered Bade (buffalo) kababs with paratha. However, I was a little disappointed with the taste. The kababs were very dry, a bit granular and high on salt. It was by no means galawati or melt-in-the-mouth. A plate of kababs with a paratha cost me Rs 80. Not the one to give up so easily, I wanted to give it one more try. I was advised to try the Chowk outlet, Tunday Kababi Grandson instead. Way inside the chowk galli the shop is quite dilapidated compared to the other one. But the kababs here were much better, they have much smaller size and serve about ten of them at a price of Rs 20. In fact, the texture was so smooth that a plate of kababs vanished in under three minutes. 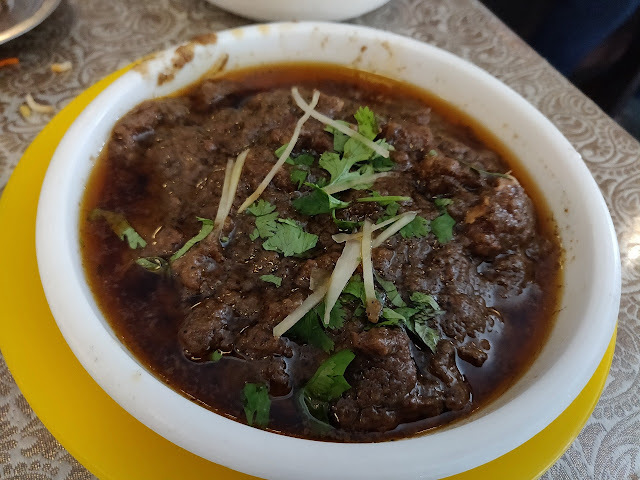 My next stop was for the slow-cooked Awadhi Nihari. Raheem Hotel almost next to Tunday in Chowk was the shop recommended to me. The kulcha nihari combo here is served in buffalo and mutton. You also have the option of going for paya nihari. The mutton nihari was full of flavours, and a little greasy will all the melted fat in it, and the kulcha soaked in it tasted heavenly. 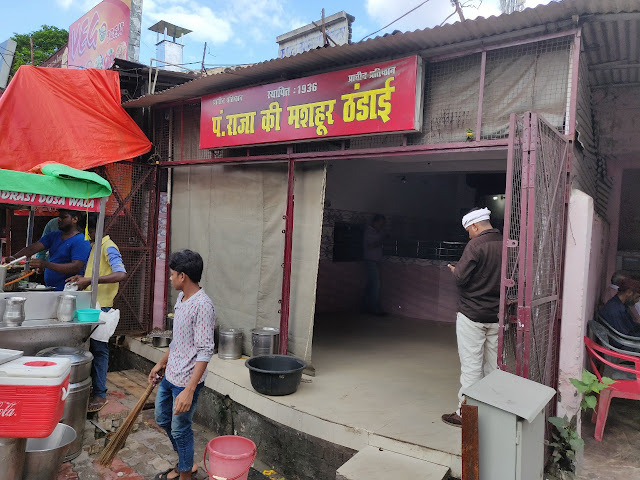 I have tried nihari from Delhi, Hyderabad, Kolkata and now Lucknow, and this was one of the best I have had along with a few places in Old Delhi. After a good non-vegetarian meal it was time to explore some of the vegetarian options around Chowk. Just outside Gol Darwaza in Chowk, there are vendors on the street selling Makkhan Malai. This dish is known as Daulat ki Chaat in Delhi, Malaiyyo in Benares and Nimish in some parts of UP. 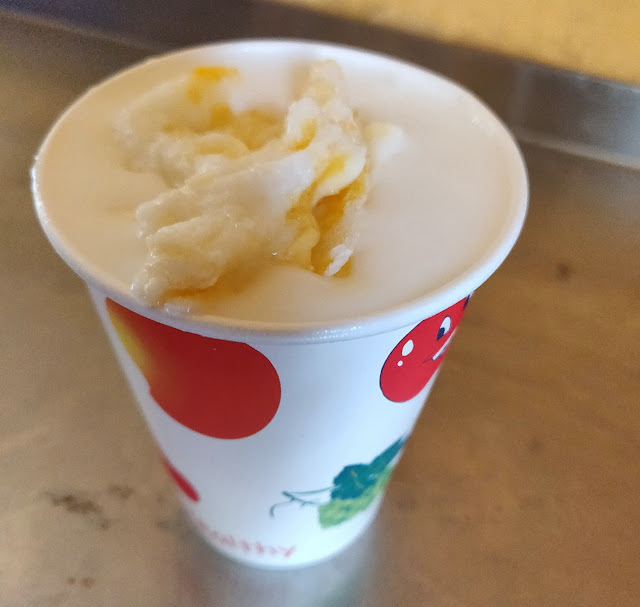 It is a saffron coloured milk foam prepared in winter by churning the milk early in the morning, after exposing it in dew overnight. In Benaras, malaiyyo vanishes at the end of winter, so I was surprised to see the dish still available here. 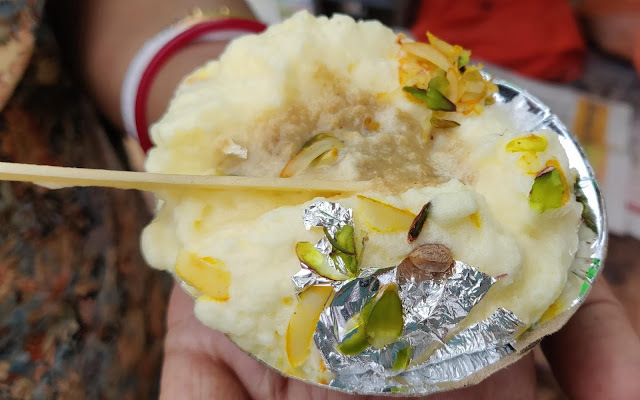 The Makkhan Malai sold at Rs 15 a cup was good, but I could not get any insight into how they manage to prepare it in this hot summer. Just next to the malaiyyo stalls is Radhey Lal Parampara Sweets which is known for Khasta Alu. 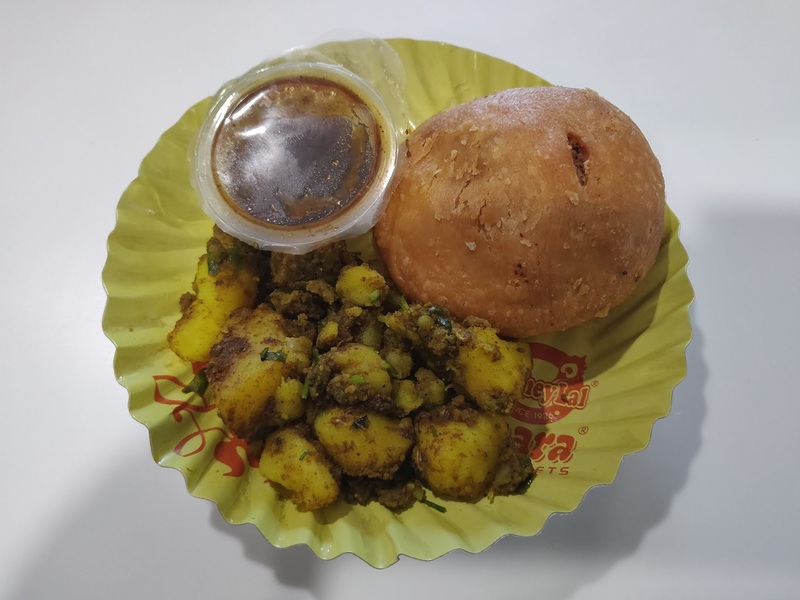 Khasta kachori is served with dry potato masala and a tamarind chutney. 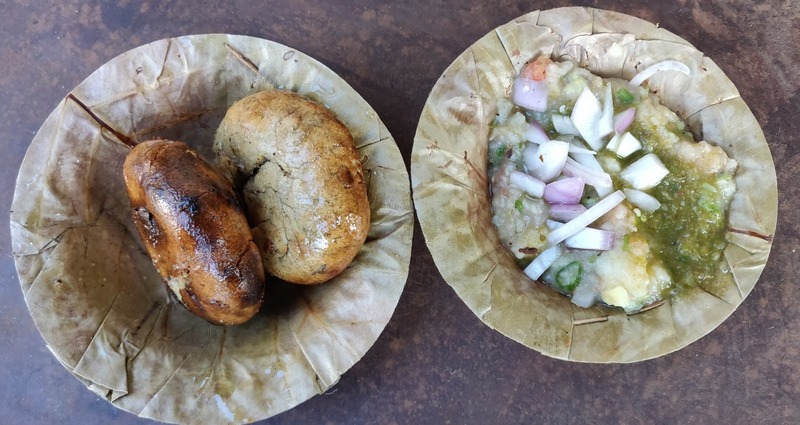 This is one of the vegetarian delicacies of Lucknow. Sri Lakshmi Lassi Centre nearby is known for their lassi, with rabri. Available for Rs 50 a glass, this was nothing extraordinary. 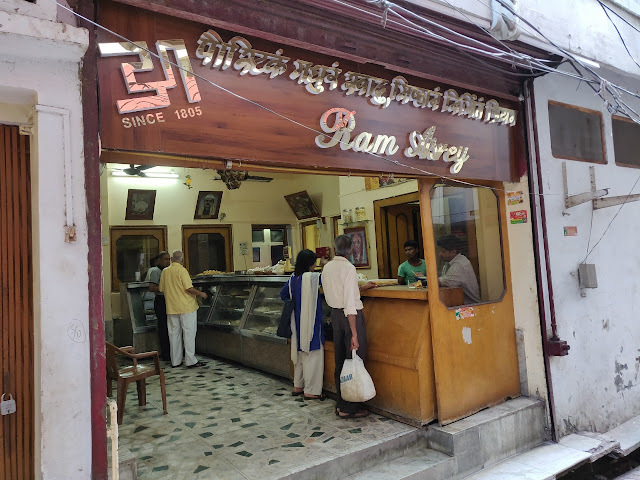 We drifted off to Ram Ashrey, a sweet shop in a galli nearby, but so famous that anyone will direct you to the place. 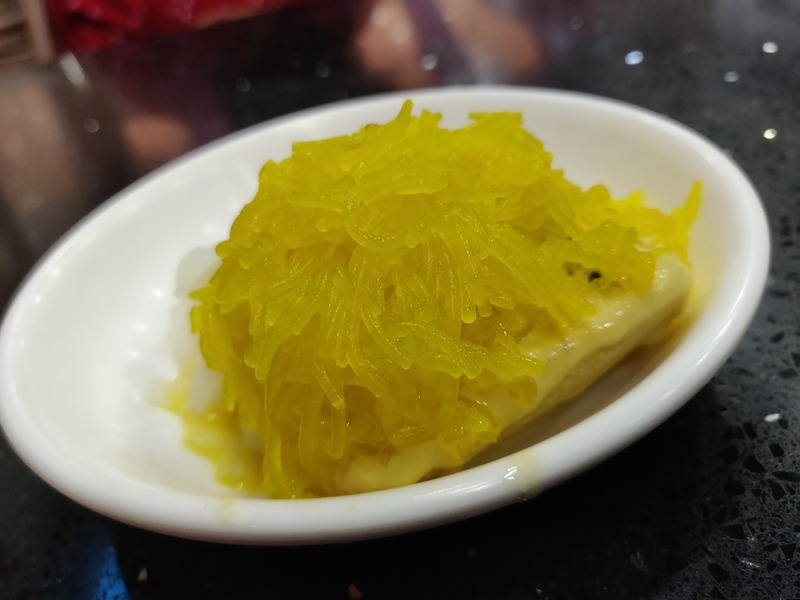 Their signature sweet is Malai Gilori, which they claim is more than 300-year-old recipe. 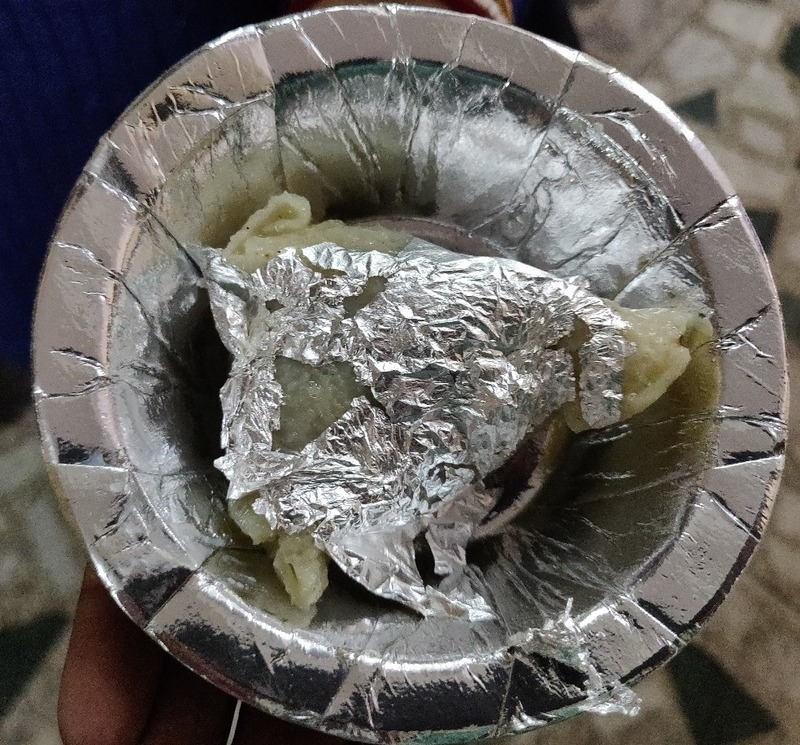 Sheets of malai shaped like a paan (gilori) has nuts and mishri in it. Pandit Raja ke Mashoor Thandai was a big disappointment. 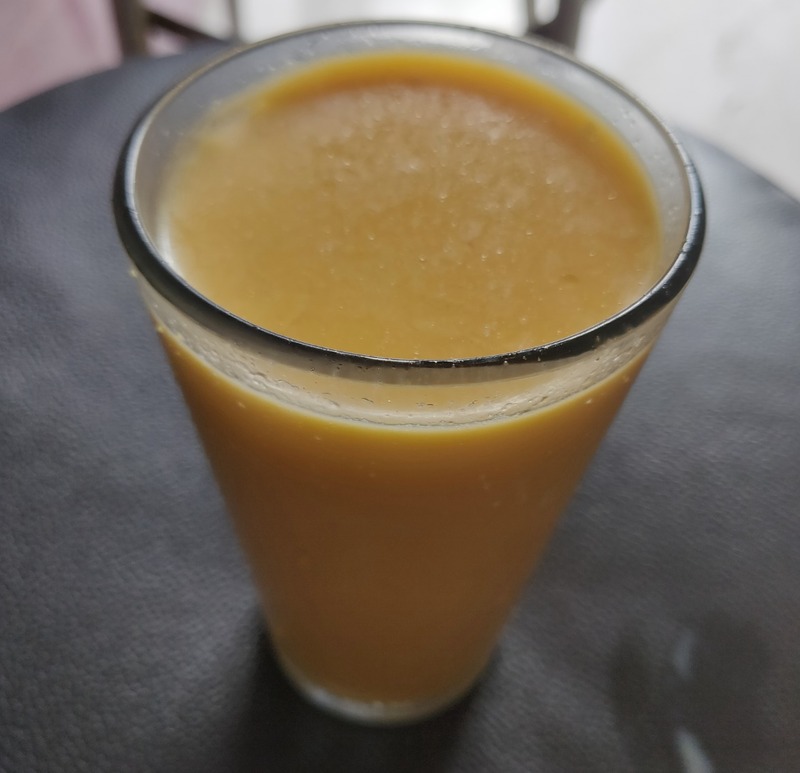 For someone who has grown up on Mishrambu in Varanasi, this was a dilute concoction which hardly impressed. 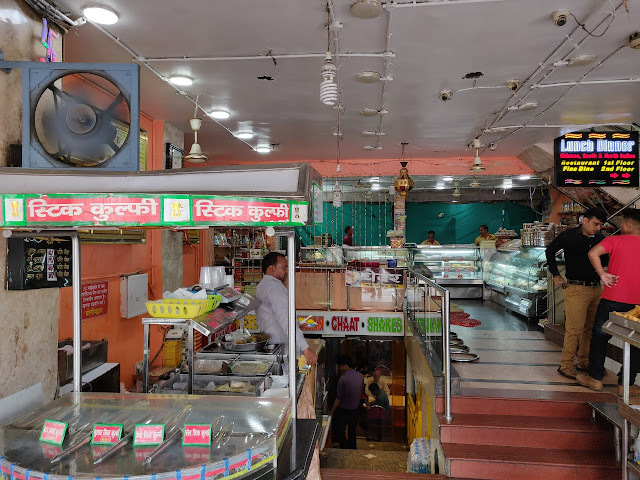 Next afternoon, we restarted our Awadhi food quest by visiting Mughal Dastarkhwan at Gomti Nagar. 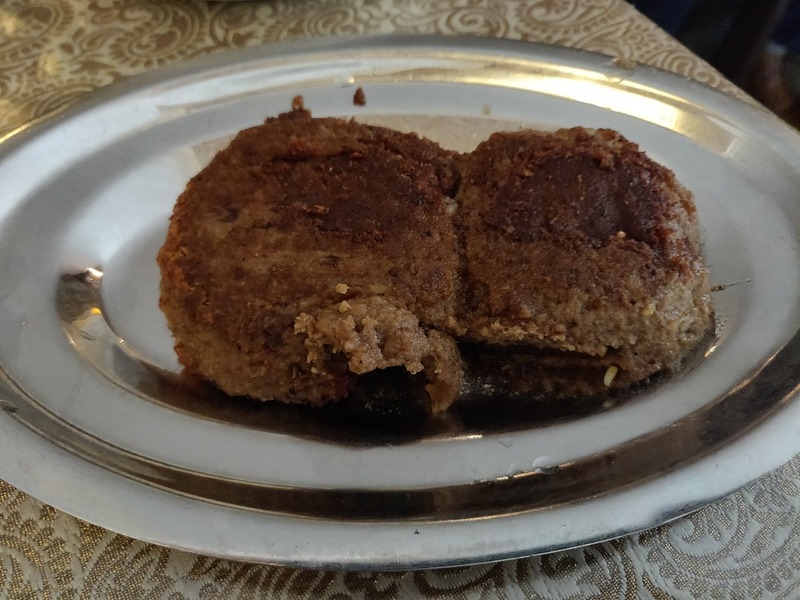 Apart from the biryani (Read about it here) we tried their Shami Kabab and Boti. 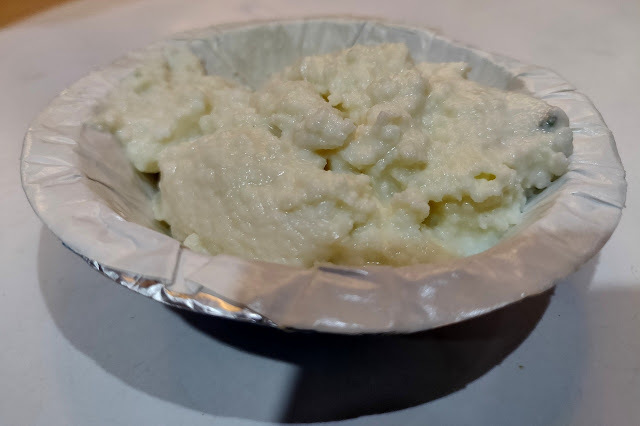 Shami is quite popular in Hyderabad too, said to have originated in Sham (the name for ancient Syria), though some others say that name is after the time of the day when it is consumed. The shami of Dastarkhwan was large and good, with ample meat in it. But the boti gravy was the clear winner – a rich Awadhi gravy with a perfect balance of spices. 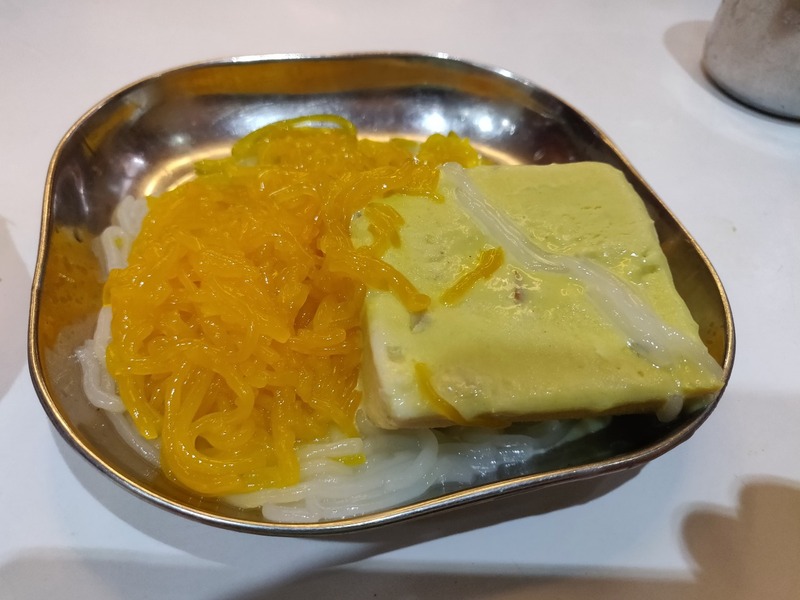 A stone’s throw from Dastarkhwan is located the Gomti Nagar branch of Prakash Kulfi, the 65-year-old brand identified with kulfi in Lucknow. A slab of kesariya kulfi served with vermicelli costs a meagre Rs 60 and tasted much better than most of the kulfi we get back in Hyderabad. A repeat was promptly ordered and savoured. Another place known for their kulfi in Lucknow is Moti Mahal. 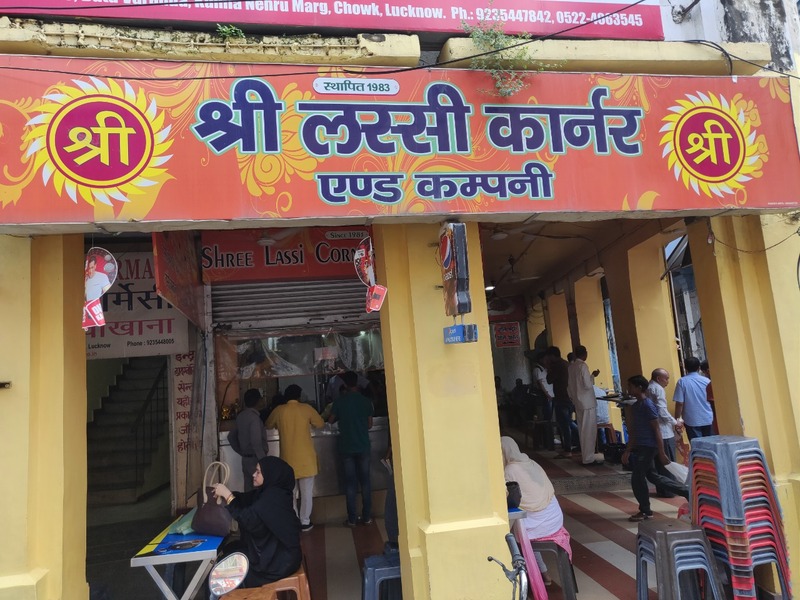 Located in the posh Hazratganj area it is a very busy restaurant, with most people preferring to stand and eat off the sidewalks. 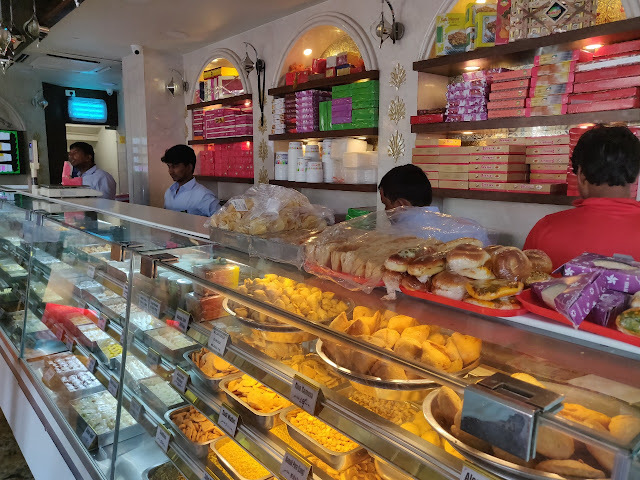 In between shopping for some famed Lucknow Chikan, we tried their rabri too, which was very decent. 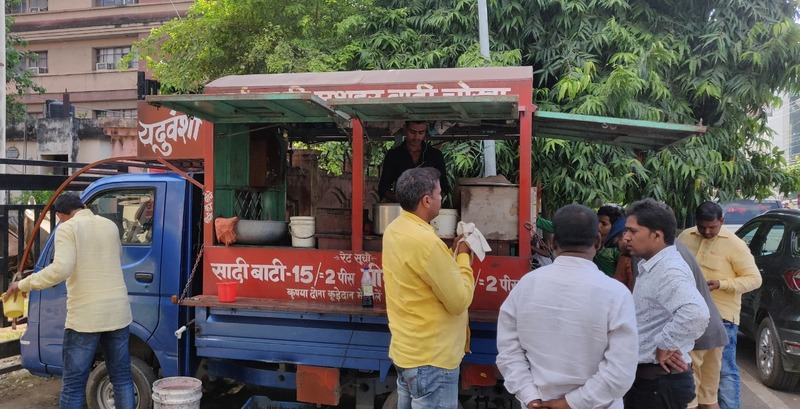 On the day we left Lucknow, we came across a food truck selling Baati Chokha near our hotel in Gomtinagar. Two batis with chokha cost Rs 15, while if you want the bati doused in ghee, it is Rs 20. The chokha which has mashed potatoes, brinjal, tomato, onions and green chilli in mustard oil was the highlight here with the roasted and slightly burnt batis. Though I could cover a little bit of my suggested list for Lucknow, a large portion was left untouched. The Murgh Masallam at Royal Café, Shammi at Sakhawat, Pasinda at Mubeen, and bheja and bakharkhani at Alamgeer were some recommendations which could not be serviced due to the paucity of time. If you get to go to these places, let me know your feedback in the comments. Of course, I am planning a repeat trip sometime too.